I don't know about you, but a while ago when I was watching Gordon Ramsay's Best Restaurant series, I was cheering on tiny vegetarian family restaurant Prashad. I knew that they had a cookbook out, but I have so many cookbooks it's sometimes hard to justify buying new ones, especially big beautiful (and expensive) hardbacks. 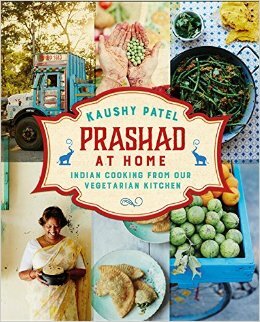 So I was super happy to find their latest cookbook, Prashad at Home, in my local library. 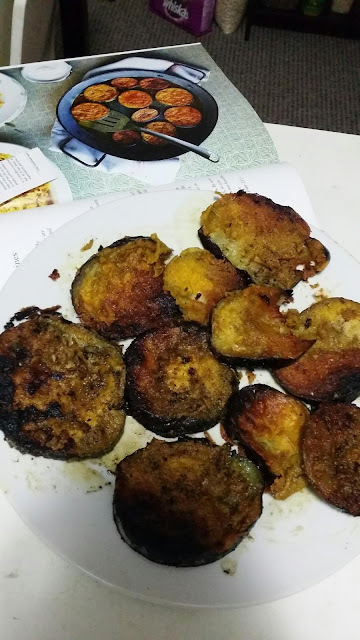 I might have mentioned before what a fan of eggplant I am, so I was intrigued by a dish I found in the book for spiced chickpea flour coated fried eggplant slices. 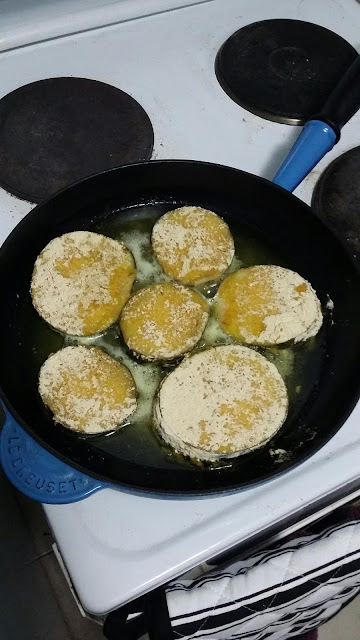 Tonight I made the dish, named Renghan Lothiu, for dinner. 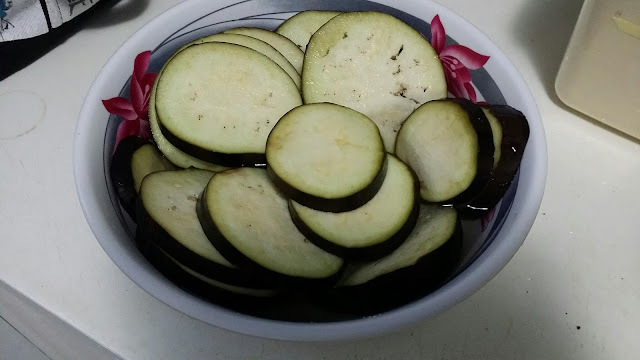 First the eggplant slices are soaked in water with one teaspoon of salt. 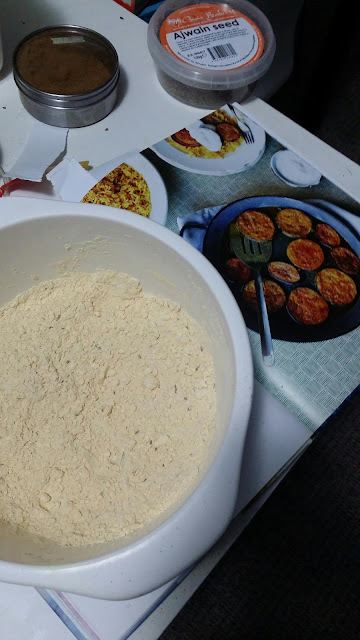 Then while the oil heats in the pan, the chickpea flour is mixed with chili powder, salt, turmeric, cumin seeds, asafoetida, ground coriander and ground cumin. Then the eggplant slices are coated in the flour mixture and fried in the oil, turning regularly to cook evenly. I think my burner plates may be too hot, as many of my slices burned a little despite my turning the heat down lower. I'd recommend a medium heat. 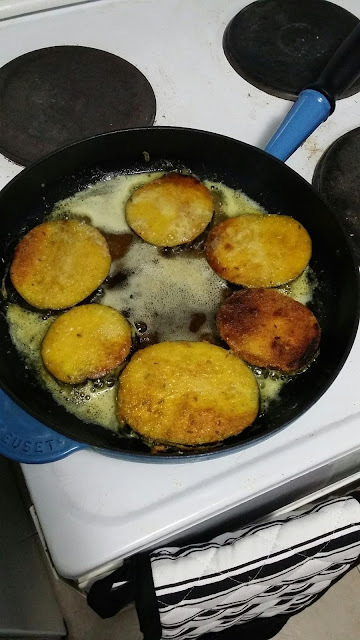 I served these with some white rice and mango chutney. 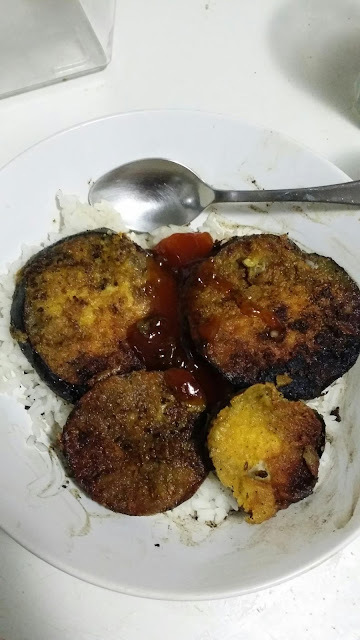 They were spicy and crunchy and the eggplant had cooked perfectly in the centre, to a gooey soft texture. Yum!